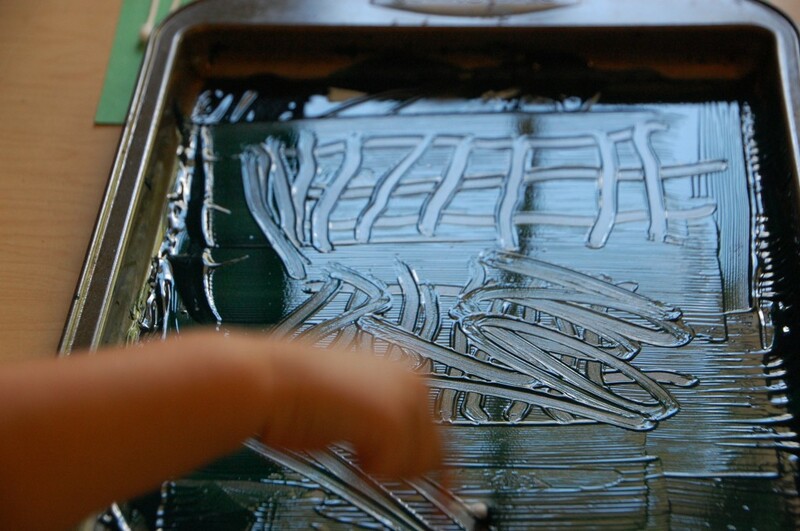 When I discovered printmaking after college, I learned how to make everything from intaglio prints to screen prints. I simply adore working in this medium!! 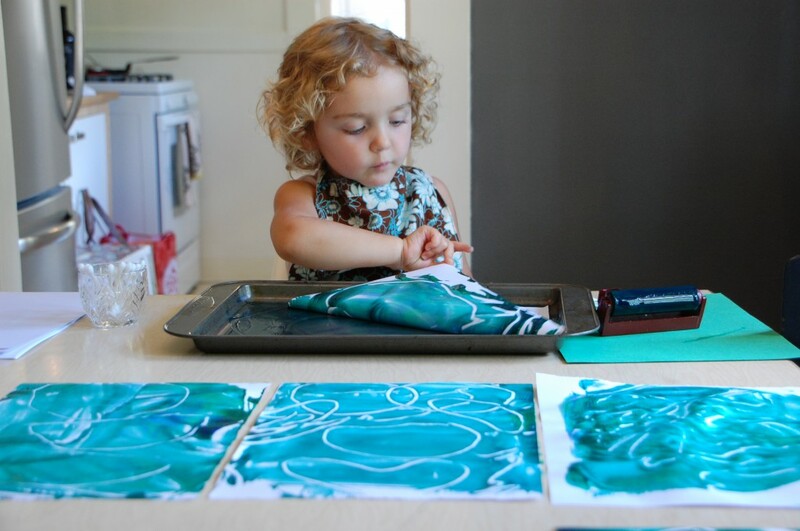 Children and printmaking haven’t been an easy combination for me — the inks can be toxic and the materials can take over a space, but I’ve been taking every opportunity I can to bring printmaking down to my child’s level, and each of our printing sessions has been engaging for both of us. There’s so much magic in pulling prints — if you haven’t tried it yet, I encourage you to give it a go. 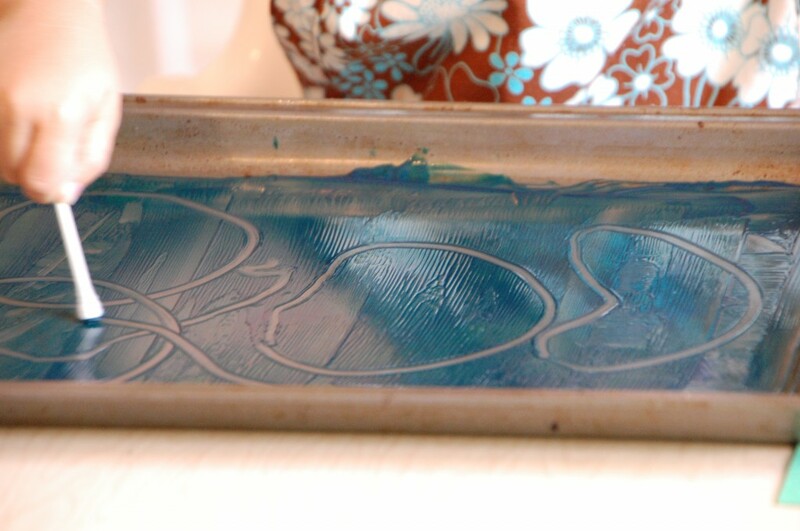 I’ll add links to our other printmaking projects at the bottom of this post. 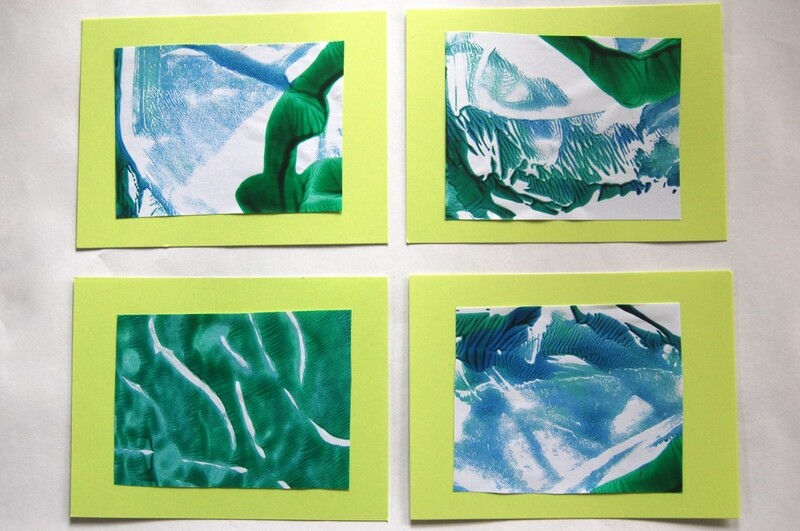 Monoprinting is a lovely combination of printing and painting. Printmaking is usually defined as a images made in multiples, and monoprints are the exception as each “print” is one-of-a-kind (“mono” meaning “one”). 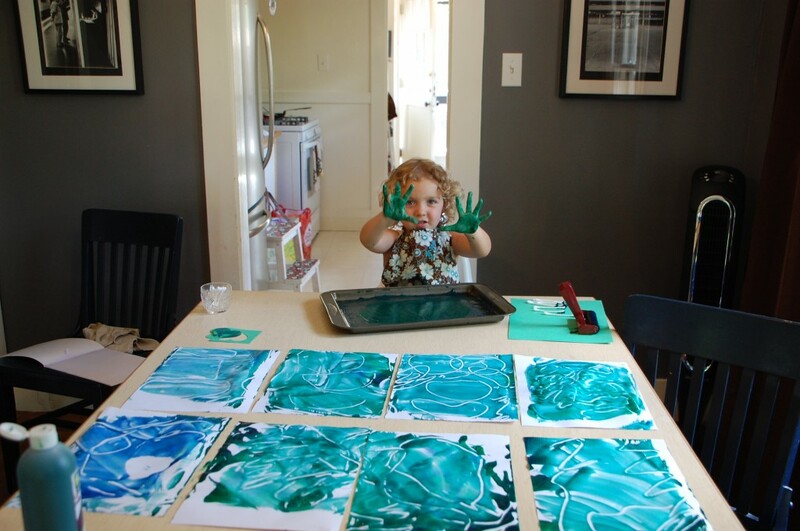 These prints are ridiculously easy to make — you just need a little bit of table or floor space to store the drying prints. N chose a green and blue paint combination. 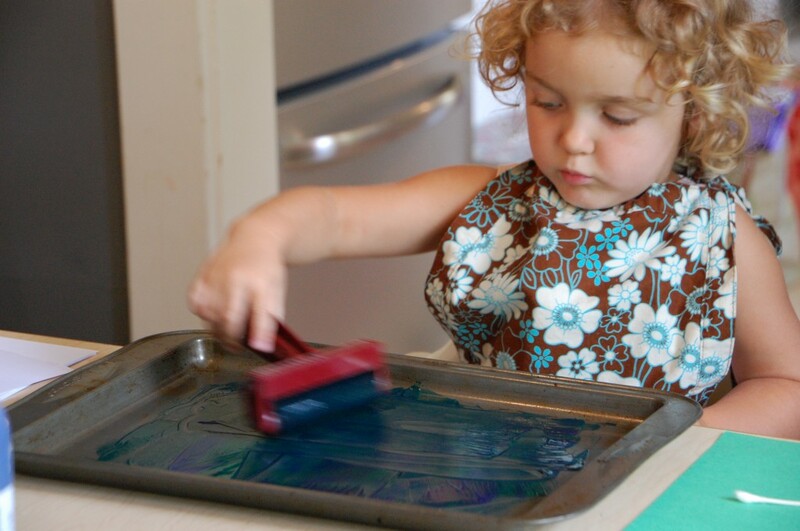 I squeezed a little bit onto the cookie sheet (you can always add more if it’s needed) and she moved it around with the brayer. 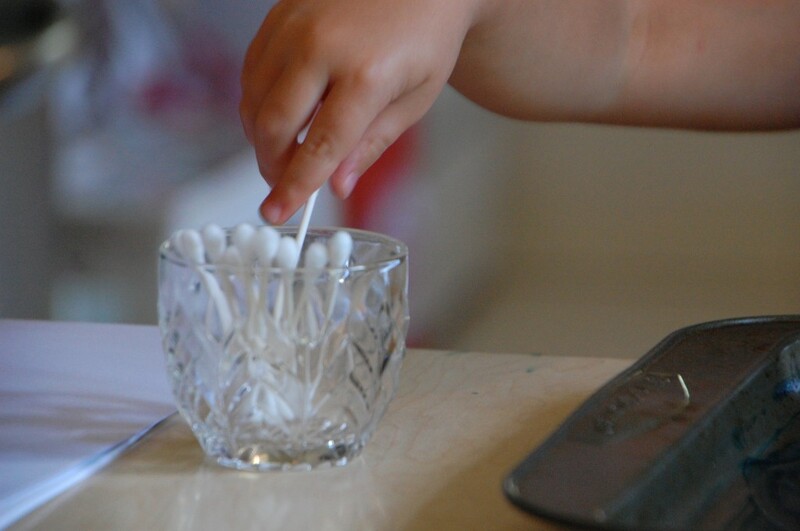 I placed a cup of Q-tips on the table for easy access. 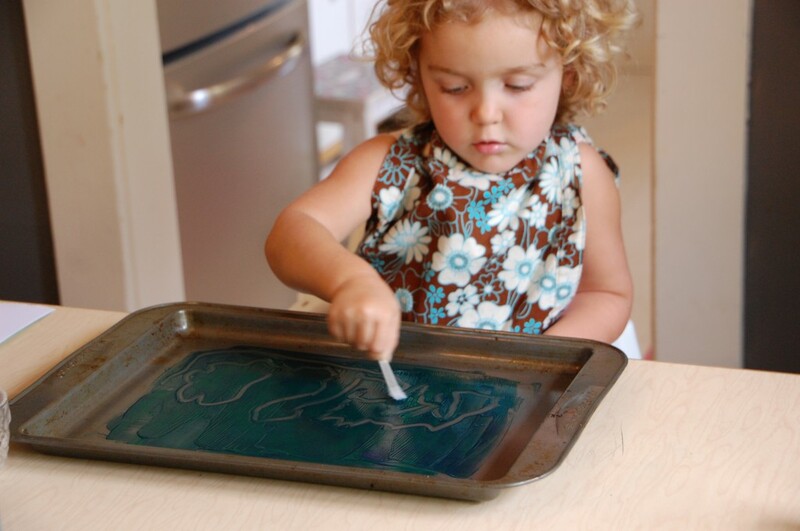 Then she used a Q-tip to make marks in the paint. 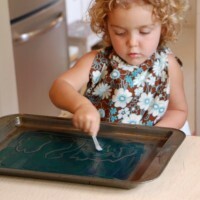 I’m interested in giving my daughter full control of her art-making experiences, and would only step in to smooth the paint or help remove/add paper. I believe that taking on the role of facilitator encourages her creative confidence. 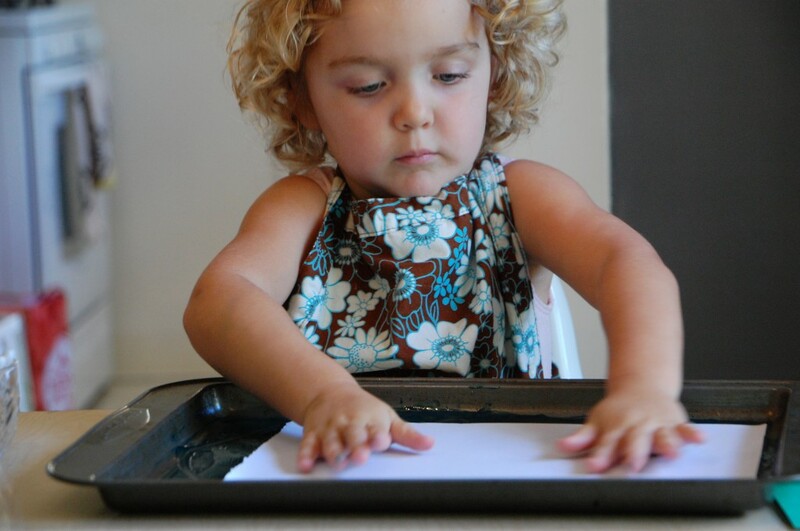 She pressed paper down to pick up the print. And peeled it back to reveal some printing magic! So many patterns and shapes were explored. 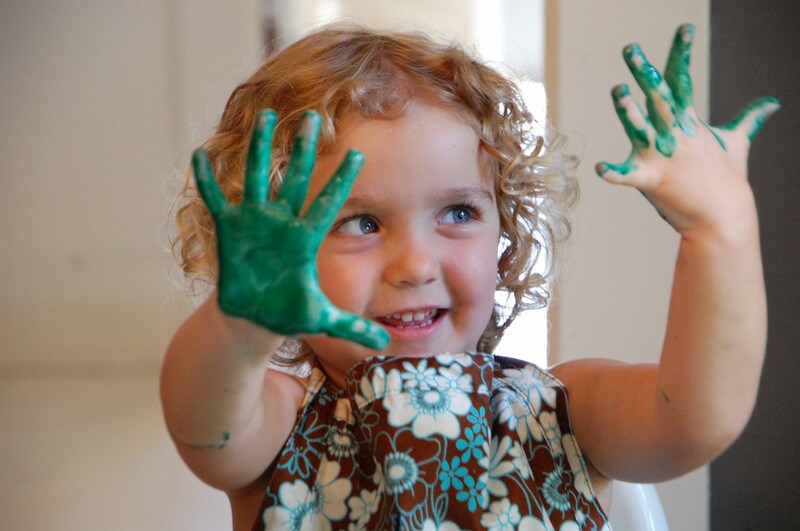 And of course, no painting activity is complete without the requisite hands-in-the-paint experience! I often get asked “what do you do with all that art after your child makes it?” If only we could keep every piece! But my house is small and I can’t keep a lot of stuff around for very long. A lot of it gets recycled, a few key pieces are saved in our archive box, most of it is photographed, a few pieces make their way onto our fridge or walls, and the rest gets turned into gift wrap, presents, or cards. Because we used thin paper to make these, they were perfect for cutting up and glueing onto thank-you cards with a glue stick.